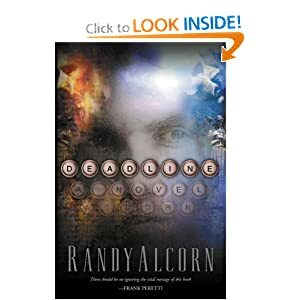 Involved in a tragic accident under suspicious circumstances, award-winning journalist Jake Woods must draw upon all his resources in order to uncover the truth in this rerelease of the Randy Alcorn bestseller. Jake soon finds himself swept up in a murder investigation that is both complex and dangerous. Unaware of the threat to his own life, he struggles for answers to the mystery at hand and in doing so is plunged into a deeper search for the meaning to his own existence. Conspiracy, the afterlife, broken relationships, salvation – Alcorn’s novel plunges the reader into all of these in the dramatic story of Jake Woods’ eye-opening experiences. After surviving a suspicious accident that claims the lives of his two life-long best friends, liberal columnist Jake Woods begins his journey of discovery. His perceptions of his best friends, assumptions about society, and beliefs about morality and the purpose of life are rocked by the revelations in the weeks following the accident. Alcorn forces readers to examine their own convictions while bringing them into the characters’ personal lives. Society’s values and anti-Christian biases are starkly revealed. The author creates an amazing picture of what the afterlike may be like for both the redeemed and those who choose to ignore Christ on earth. Though at times the “visits” to heaven interrupt the flow of the narrative, they still create excitement about the possiblities that may await in eternity. I thoroughly enjoyed this book for entertainment and its eye-opening perspective.